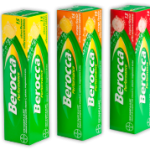 Home / Health/Nutrition / Berocca: The Wonder “Drug”! Actually, Berocca is a vitamin/mineral supplement that I discovered the first time I went to Paris to shoot 30 yoga DVDs. Last week’s post I wrote about the supplements I take daily and I forgot to mention Berocca as one of my favorites. It’s a fizzy little orange tablet that you drop in water and let dissolve. It’s tasty, sugar free and full of vitamin C, B vitamins, Magnesium, Calcium and Zinc. I swear these things keep me from getting sick especially when I have such an active schedule like shooting 30 DVDs in 2 weeks or 10 video for my new app in one day. Whenever I fly or travel, or start feeling a little worn down, I make sure to pop a Berocca. I also love the little brain gym exercises on their website! Choose to Move! Wellness Week kicks off next Week! Naked Power Garden Sweepstakes and National Drink your Veggies Day!